The fruits are red, yellow, purple or black. Pungent, hot and spicy. The flowers are greenish white or yellowish white. Can be called the Thai Chilli as well. 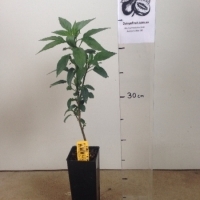 The plant can grow up to 2m tall however very easily stays small especially in pots. It's origins are from Mexico however it is most famous for being used in Vietnamese cooking in soups, stir fries and salads. 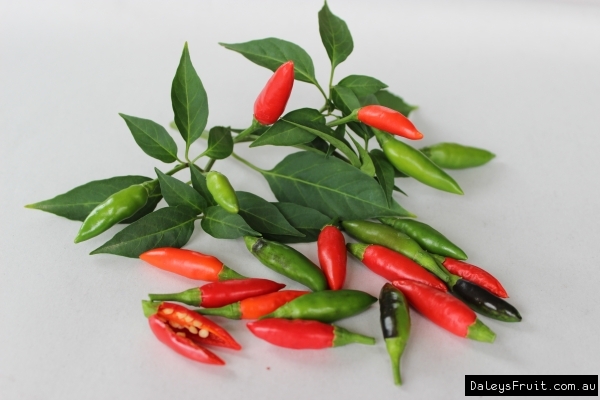 Thai cuisine commonly uses this chilli and it is because it has a fruity taste and an extreme spiciness. 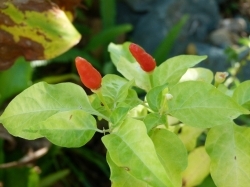 Many of the Thai curries are centred around the flavour of the Birds Eye chilli and it has become so common in Thai cooking that it is often just called the Thai chilli. Because they go well in pots many people who couldn't grow these fruits outside in colder climates can keep them protected and enjoy them fresh rather than store bought. Excellant addition to all sorts of dishes. They can be used fresh or are easily dried for extended shelf life. The bush can grow into quite a siuzeable 'tree' and is very ornimental in the garden. Chooks and some native birds love the fruit as well!! I love using chillies however I tend to kill them but this little plant has self seeded so I get to try again. Comments: - Like the change in colours from yellow to red. There hot with a kick and asian people love them. Once in the ground and well astblished dont even have to water them , yet the fruit be very small and the biggest harvest is in the secound year onwards . 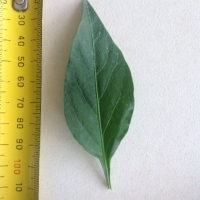 Pest Control: Nature ,the most you get is Aphids , yet let nature do its job if you have healthy plants ,if need to spray use a chili and soap spray . We love chilli in our food, nearly every day. I think it's addictive! 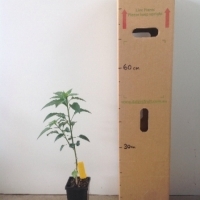 My plants are grown from seeds and are performing well with little care. We freeze the fruit when there are more than we can handle. Frozen chillies are good for a few months.